Supply Services Branch SSB has the responsibility to coordinate the purchase of goods, as requested, on behalf of program YG departments. 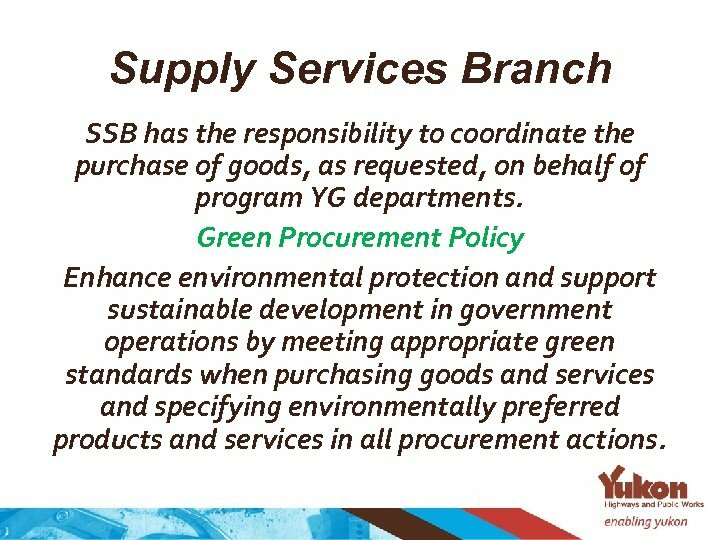 Green Procurement Policy Enhance environmental protection and support sustainable development in government operations by meeting appropriate green standards when purchasing goods and services and specifying environmentally preferred products and services in all procurement actions. 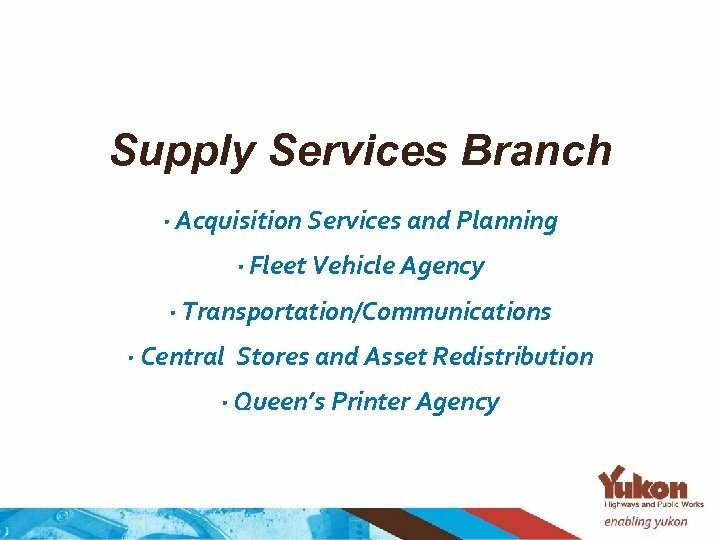 Supply Services Branch Central Stores and Asset Redistribution provides assistance to all government departments, Agencies, and Corporations in the management, control, redistribution and disposal of publicly owned assets. 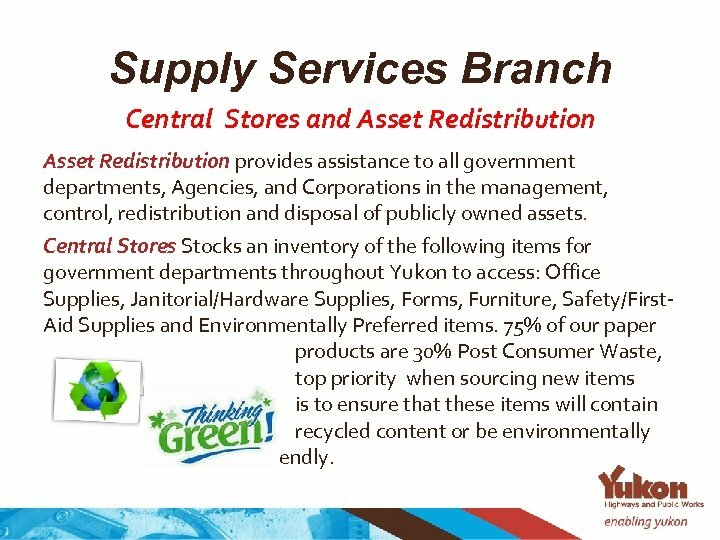 Central Stores Stocks an inventory of the following items for government departments throughout Yukon to access: Office Supplies, Janitorial/Hardware Supplies, Forms, Furniture, Safety/First. Aid Supplies and Environmentally Preferred items. 75% of our paper products are 30% Post Consumer Waste, top priority when sourcing new items is to ensure that these items will contain recycled content or be environmentally friendly. 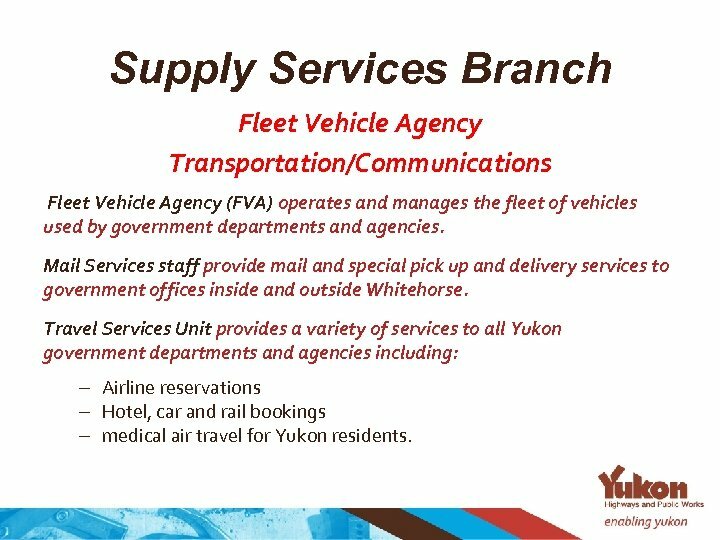 Supply Services Branch Fleet Vehicle Agency Transportation/Communications Fleet Vehicle Agency (FVA) operates and manages the fleet of vehicles used by government departments and agencies. Mail Services staff provide mail and special pick up and delivery services to government offices inside and outside Whitehorse. Travel Services Unit provides a variety of services to all Yukon government departments and agencies including: – Airline reservations – Hotel, car and rail bookings – medical air travel for Yukon residents. 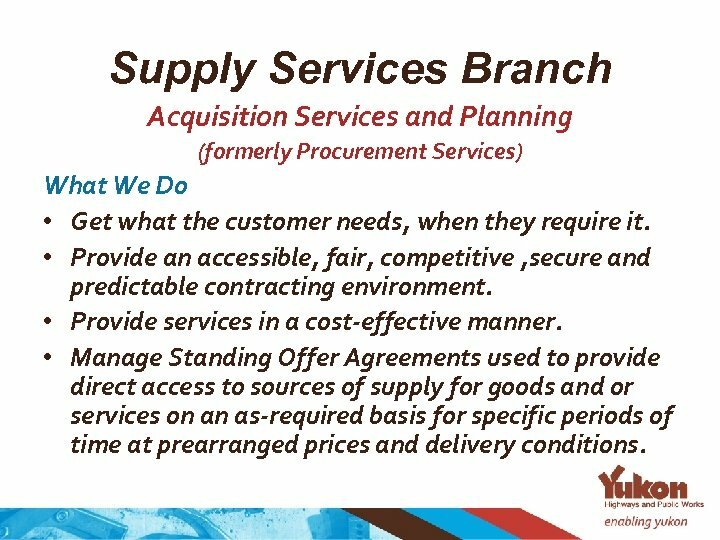 Supply Services Branch Acquisition Services and Planning (formerly Procurement Services) What We Do • Get what the customer needs, when they require it. • Provide an accessible, fair, competitive , secure and predictable contracting environment. • Provide services in a cost-effective manner. • Manage Standing Offer Agreements used to provide direct access to sources of supply for goods and or services on an as-required basis for specific periods of time at prearranged prices and delivery conditions. Supply Services Branch In Yukon, the Queen's Printer has been in existence since 1976. It performs its basic function as a legislative printer, comptroller of stationery, printer for YG departments, publisher of the Yukon Gazette, and printer of the proceedings of the Legislative Assembly. 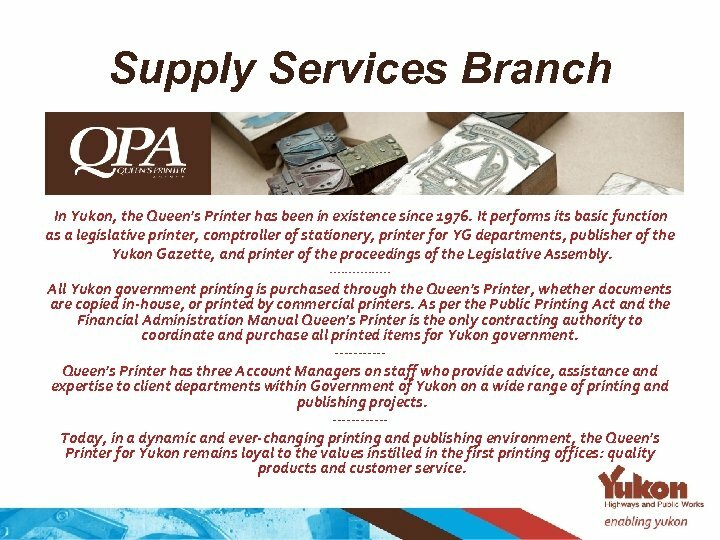 -------- All Yukon government printing is purchased through the Queen's Printer, whether documents are copied in-house, or printed by commercial printers. As per the Public Printing Act and the Financial Administration Manual Queen's Printer is the only contracting authority to coordinate and purchase all printed items for Yukon government. ------ Queen's Printer has three Account Managers on staff who provide advice, assistance and expertise to client departments within Government of Yukon on a wide range of printing and publishing projects. ------ Today, in a dynamic and ever-changing printing and publishing environment, the Queen's Printer for Yukon remains loyal to the values instilled in the first printing offices: quality products and customer service.